5 Steps To Ensure Audit-Proof Medical Claims with ICD-10 - Outsource Management Group, LLC. You know how important submitting accurate medical claims are for the health of your practice. With a solid and detailed coding policy in place, your practice can ensure strong documentation to prove medical necessity for services that your physicians provide, and get paid accurately for those services. Step 1: To design an effective coding policy, start with making sure that you adhere to the ICD-9-CM Official Guidelines for Coding and Reporting. Not keeping yourself up-to-date with these standard rules can land you into big trouble. The Official Guidelines are updated each year and are available just a short time after the annual updates are announced. If you keep yourself and your staff up to speed on the rules in the official guidelines, you would not need to worry about getting any surprises from any across-the-board ICD-9 coding changes. Step 2: Set down in writing the process in your office, including who writes the claims and how and when you would make corrections in them. For example, you may get all the claims checked and signed off by a certified medical coder to ensure that all the diagnosis codes with correct fourth or fifth digits are listed in the correct order. Step 3: It is also a good idea to write down how your coding staff will stay up-to-date with the latest changes and ensure that they remain competent. Keeping you staff on top of all these changes, whether to the official guidelines, insurance provider requirements, or the about-to-happen transition to the next year’s procedure or ICD-10 codes can be especially helpful. You can organize seminars and training sessions for your staff. However, training should not stop at the level of the coders. You must also ensure a free exchange of information between your coding staff and the physicians so that all of them understand the common coding errors and learn to find solutions, and submit claims that will fearlessly face the scrutiny from auditors and providers. Step 4: This is an extremely important step. Develop your auditing process—including the number and per cent of charts that you’ll audit for accuracy and how often you will conduct those audits. Internal audit can help you to correct any errors before they are found by an external auditing entity, which may cost you heavily. In addition, the internal will also help you measure your coders’ accuracy. Step 5: Always keep your policies current. Make an effort to check them periodically to make sure that it is updated and adheres to the guideline. However, you must never write policies that attempt to explain how you’re going to report a particular diagnosis. Rather aim to establish general policies that address the methods you use to keep your coding accurate are more useful and workable. 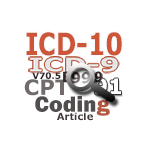 Don’t wait for the ICD-10 codes to go into effect. Start preparing right now to ensure that you pair the correct ICD-10 and procedure codes, and get the reimbursement you deserve. How Can An Outside Audit Help Your Practice?